Every Note In The Western Scale. 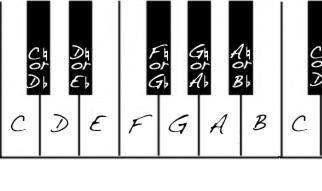 The Chromatic Scale is the same whether ascending or descending and regardless of key signature. It is created by including every key on the keyboard all white and all black keys. One cool thing that i just learned is if you play a C chord with you right hand and then with your left hand starting on the C note a octave or 2 down play Chromatic it sounds cool and is a great way to get ideas.